What makes a good story you ask? A good story is made up of pictures, it’s made up of seconds and it’s made up of friends. The story I am conveying is none other, but the Snapchat story. Snapchat is one of my favorite mediums to tell a story, but it needs to have a few concrete requirements in order to be exciting. By following these three things, Snapstories are more enjoyable. Having it less than 70 seconds allows a viewer to stay interested. Even though Snapchat stories can be fast-forwarded, it is best to make sure that your viewer doesn’t get bored. By having a funny or exciting Snapstory with people other than yourself, your content will not be fast-forwarded. 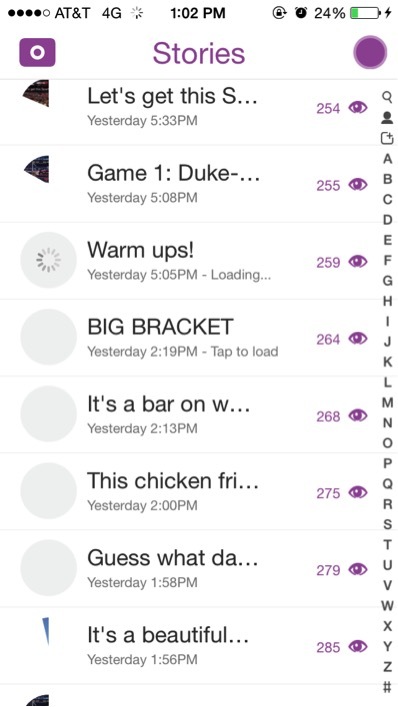 It’s one thing to have a Snapchat story, its another thing to have a story that gets talked about. By doing these things, it will makes sure that your story is entertaining and ready to be watched. I am not a fan of seeing weather posts, we all go to Syracuse and signed up for 30 degree weather, it isn’t necessary to make an entire Snapchat story dedicated to it. These are just a few things to make this creative medium more entertaining and worthwhile. At the end of the day, using these ideas of a Snapchat story are relate-able to any type of story. As the creator of content, you want to make sure that the content short and to the point. While it can be longer if necessary, it needs to be done once in a blue moon – you don’t want to be known as the person who has a 120 second Snapchat stories. You also need to make sure that the content needs to be relate-able in some way, or outrageous. By doing this, a person will be engaged in what was going on and will continue to read or watch the story. Using Snapchat stories also reminds you that you can’t be selfish all the time. While a Snapchat story is about your life, you need to remember that being relate-able will keep a story alive. Firstly, I love that you had a unique interpretation of the assignment and specifically narrowed your topic down to the do’s and don’ts of making a Snapchat story. The topic alone helped to differentiate your piece from others’, who discussed what makes a good story in general. Also, I think a common goal for Snapchat users is to get numerous views on his/her story of the day and I definitely agree that your points are great tips for accomplishing this goal. Snapchat is becoming so popular and you do a great job connecting with the audience/ potential snapchat users like myself.